Its last service was in December and this boat is in tip-top shape for the summer ahead. Whether you're heading to Rotto for a week or having a Friday night cruise up the Swan, this boat ticks all the boxes. Description: Riviera M360 Sportscruiser 2007 Riviera M360. 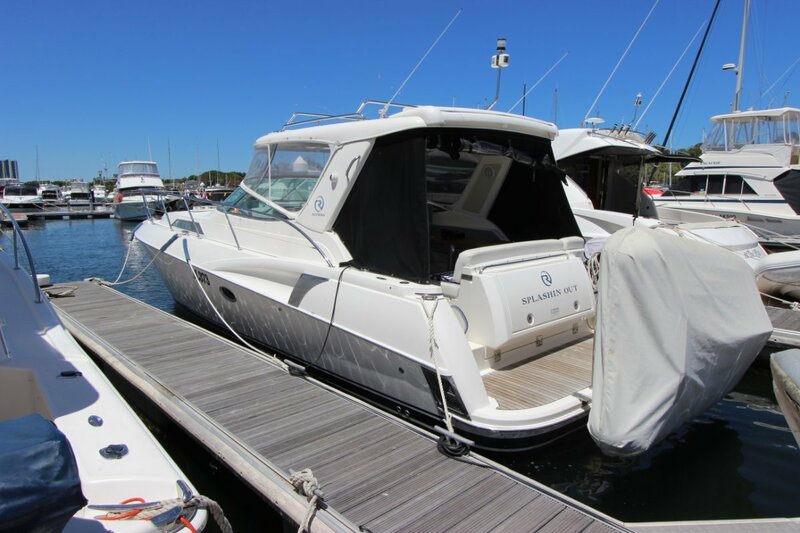 Twin Mercruiser 6.2 (320HP) serviced December 2018 including new spark plugs. Bravo Three legs (serviced March 2018) and prop speed. Transom Assemblies changed March 2016 (20K ten years is there end of life). Manifolds and risers changed April 2016. 6KVA Onan generator serviced December 2018 including spark plugs. Raymarine C10 plotter with sounder. 2.7 Mt Plastimo tender on snap davits. Berths - One double, two singles and cabin lounge converts into double. Full galley, Fridge, microwave, hotplate. Entertainment - TV, DVD, Radio/CD with MP3 input. Safety Gear - Epirb, flares and 7 life jackets. Electron ics Raymarine C10 with sounder. Deck Gear Front sun bed.